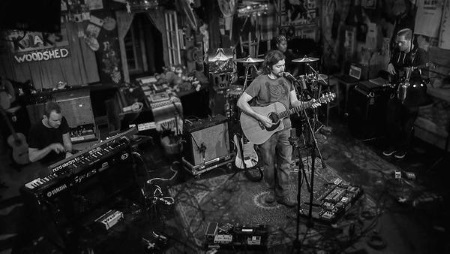 Shortly after he released his self-titled debut EP, alternative rocker and multi-instrumentalist David Small enlisted three musicians to play the Piuma songs live in Studio City, CA @ Kulak's Woodshed. After three rehearsals, they went in at the deep end. The proceedings on stage could be watched via HD webcast. Most of the show is now released as a digital LP, Born. Lamar Little (drums), Max Butler (keys), and Mike Roberts (bass) rose to the challenge and found a few spots for improvised sections that will appeal to the jam band fans, with the extended As Far As the Eye Can See (watch it on the Relix website) as the prime example. Beyond the Bubble now sounds cheerful and the previously unreleased Nymph has the potential to turn into a major funk monster. The on-the-spot improvisation and letting go of the studio versions give the tracks room to breathe. Born sound more alive (no pun intended) than the studio EP. Small is trying to find his way in the jungle of music publishing in order to include three mashups for a future re-release. During the show they combined some of his favorite artists (Pink Floyd, Led Zeppelin, Bob Marley and the Wailers, Van Morrison, and Eric Clapton). Maybe it's a blessing in disguise that they are not on Born right now--his own material is strong enough to stand its ground. Born is a self-released album. Buy it from his website. $1.00 from each album sale is donated to the nonprofit TreePeople, which has planted over 2 million trees over the past 40 years. Each record helps offset 400 lbs of carbon; the equivalent of one month of an average household's power.